Ed Westwick as Jonny and Felicity Jones as Kim in Phil Traill's CHALET GIRL. An IFC Films release. Chalet Girl Films Ltd © 2011. Pretty tomboy Kim (Felicity Jones) used to be a champion skateboarder, but now she flips burgers to support herself and her dad. Opportunity comes knocking when she flukes a winter-long catering job in one of the plushest ski chalets in the Alps. At first, Kim is baffled by this bizarre new world of posh people, vintage champagne, epic mountains and waist deep powder. Then Kim discovers snowboarding, and her natural talent soon sees her training for the end-of-season competition, with a chance to win major prize money. But before she can become a champion again, Kim needs to overcome her deepest fears -- and figure out what's going on with Jonny (Ed Westwick), her boss' handsome but apparently unavailable son. The story of Chalet Girl began three years ago when producer Harriet Rees attended a pitching competition at the Cheltenham Screenwriting festival. 'The winner was a writer called Tom Williams,' says Rees. 'who had some great ideas. We got chatting and he gave me a series of three-line movie pitches, including one called Chalet Girl about a girl from the wrong side of the tracks who lands a job in a ski resort, but is totally out of her depth until she steps on a snowboard. I loved the idea, not least having been a chalet girl myself once upon a time. And the story is so appealing -- a real triumph over adversity tale. I got some vital early support to begin the development process from Screen South, and the idea began to take off. Then I did some work with experienced Screen South based producer Pippa Cross, and we agreed to produce the film together.' Director Phil Traill was a perfect choice for this material with a Berlinale winning short film behind him, a first Hollywood feature in the can, and a talent for comedy, not to mention an obsession for snowboarding. Coincidentally he had been at Newcastle University with the writer, where they both studied Film Studies. Tom made the introductions and the four set about development in earnest. 'The fact that I already knew Tom made developing the screenplay really fun,' says director Phil Traill. 'And of course we had to go and find our locations in the Alps.' Harriet and Pippa had already managed to fit in some advance work there. Harriet explains, 'It was tough persuading anyone this was 'work' when I was fixing trips on private jets to Meribel and on to Laax for the British Snowboarding Championships! But we had to research the snowboarding world, which we did with the help of 'Brits' organisers Soulsports, and made early contacts with key player Roxy, before moving on to the lovely, and very welcoming resort of St Anton' Here we really got lucky ' adds Pippa, ' as we found our 'chalet' -- perfect to play Kim's new workplace and happily available to us even in high season as it now functions as a museum and restaurant.' And finally to another beautiful town, Garmisch Partenkirchen, where they planned to shoot many of the interiors as well as more mountain scenes up the impressive Zugspitze, with the enthusiastic support of the Bavarian Film Fund, brought on board by German co-producers Dietmar Guntsche and Wolfgang Behr of Neue Bioskop. Brooke Shields admits to feeling somewhat torn in her relationship with the young cast. 'I ran the gambit of feeling like I was one of them and also feeling ancient,' she laughs. 'I felt honored to be included, but then I'm playing their mother so it was a little bit disconcerting. The thing that pleasantly surprised me was that nobody had an attitude. We worked long hours and they worked hard and the conditions were sometimes hard but there was a camaraderie. I actually saw Ed a little while after filming had finished and he was like, "I really miss you guys." And I know what he means because I miss everyone too. We were with each other every day. It doesn't happen often that such a variety of people just bond together. It's a cliche but it was really special. Now we can look at each other and say, "hey, we've been through something together." Sophia Bush, who plays Chloe in the film, agrees. 'I was very, very lucky that I didn't have to do much of the mountain work,' she sighs with relief. 'It was very intense up there. I think Phil had to do a lot of improvising around the weather. We were luckily due to leave St Anton for Germany as all the snow melted in St Anton. Then the snow melted in Germany and it started snowing again in Austria. It did feel a little bit like being at the mercy of the elements. Georgia King, who plays chalet girl Jules, laughs in agreement. 'On paper, this film sounds great,' she smiles. 'In reality, it's any director's nightmare. Weather-wise it was ridiculous - either too hot, too cold, too much snow, not enough snow. Also key to the 'on the snow' process were Soulsports consultants Spencer Claridge and Stuart Brass, both ex pro boarders now working fulltime 'backstage' in the sport. Every scene on a snowboard needed to be graded to show Kim's progress, and then choreographed and delivered by a careful mix of stunt doubles, performance doubles and the actress herself, as far as insurance would allow! Cross explains "Spencer and Stuart worked really hard with Phil, Ed Wild DOP, Joe Geary our first assistant and the wonderful local team of Jens Hoffman, second unit director, and Torsten Jerabek, stunt coordinator, to ensure a real authenticity for all our snow boarding scenes, especially the final competition scenes at the Roxy Slopestyle Pro. Balancing so many issues, creative and practical, was a huge achievement for them". 'The cast on this film is just so exciting,' grins Phil Traill. 'The first person we cast was Felicity Jones, (who plays heroine Kim Matthews) because it's her story. We got to meet many of England's leading young actresses. Then Felicity came in, who I didn't know before but, ten minutes later, she had the part.' Pippa Cross and Harriet Rees nod in agreement. 'As soon as we saw Felicity, it was a no brainer,' says Rees. Cross agrees. 'After all those months developing the script, it was like Kim had just walked through the door.' Felicity Jones found herself drawn to the script simply because she loved the character. 'I've never played anyone quite like that before,' she smiles. 'And the script was very funny. I also liked the interaction between Kim and the Madsen family. It was an interesting investigation of the difference between moneyed English people and non-moneyed. Even though they're from the same country, they're completely foreign to each other. In terms of wardrobe, I wanted to make Kim as convincing as possible. She's not particularly vain and would never think about trying to make an impact in what she wears as she's quite a practical soul, so it was all about trying to make the costumes relaxed.' And it wasn't considered a problem that Jones couldn't snowboard? 'Very few of our cast had ever stepped on a snowboard before,' laughs Rees. 'But they can all do it now,' adds Cross, proudly. 'Felicity and Tamsin have kind of fulfilled their roles -- and their destinies -turning into a great boarder and skier now". Despite initial appearances on screen, the two actresses got on brilliantly on set. 'Working with Felicity is fantastic because she's so lovely,' sighs Egerton. 'So it's quite easy to look at her in her little t-shirt and jeans with her beanie hat and think "ahhh, you are out of place here, aren't you?" I of course, for my character, had all the gear, but at a personal level I was pretty daunted when I first got here. Skiing is such a cliquey thing. You feel like such an outsider when you first arrive. 'Egerton credits director Traill with making everyone feel at home. 'Phil is fantastic,' she says. 'He's like a mate and was very good at getting us to bond. And he's open to suggestions, so there are a couple of lines in the film that I'm quite chuffed with because they were my idea. Like the rest of the cast, Bush was drawn to the project by the inspiring story. 'It's such a great thing when you read something that is so empowering for young women,' she smiles. 'It has a great message about really going for it, just being yourself and refusing to compromise on that, no matter what the situation.' But there was one other reason why Bush was keen to be involved. Joining the young cast from the UK and USA is rising star Ken Duken as the mad Finnish snowboarder Mikki who takes Kim under his wing, and (in his words!) teaches her everything she knows. Duken had a very busy schedule but his pleasure in the screenplay meant he was determined to fit in his weeks in the mountains. It was also a pleasure to return to Bavaria where the young Duken grew up and learnt to snowboard. Like the rest of the cast, Shields was impressed with Traill's directing style. 'Phil is so fun, he is definitely one of the team, but he can also be tough when he needs to be,' she says. 'He was able to be this figure of authority even for me, when I'm older than he is. Bill and I had a huge amount of respect for the way he directed, and the way he talked to us. He wouldn't let us get away with losing focus.' Traill is also quick to praise Shields and Bush and their contribution to the film. 'Brooke and Sophia play the nastier girls in the movie but they had lots of ideas of how to make them three dimensional and interesting,' says Traill. Playing Kim's Dad Bill, Bill Bailey was a wonderful addition to the cast. And although all his scenes are set in their East End house, these were all shot in beautiful Garmisch- Partenkirchen. Bailey was delighted to be asked to play a fully three-dimensional role ('not a druggie or a weirdo') and his relationship with his daughter Kim gives the film a real emotional depth. Bailey only just made it out to Bavaria for the shoot when Icelandic volcanic ash closed European airspace. He made his way from Spain after purchasing a much lusted after vintage Citroen! After so much mayhem over travel issues, he was often to be found in his trailer in Garmisch calmly composing temp cues to inspire Phil Traill for the eventual soundtrack. 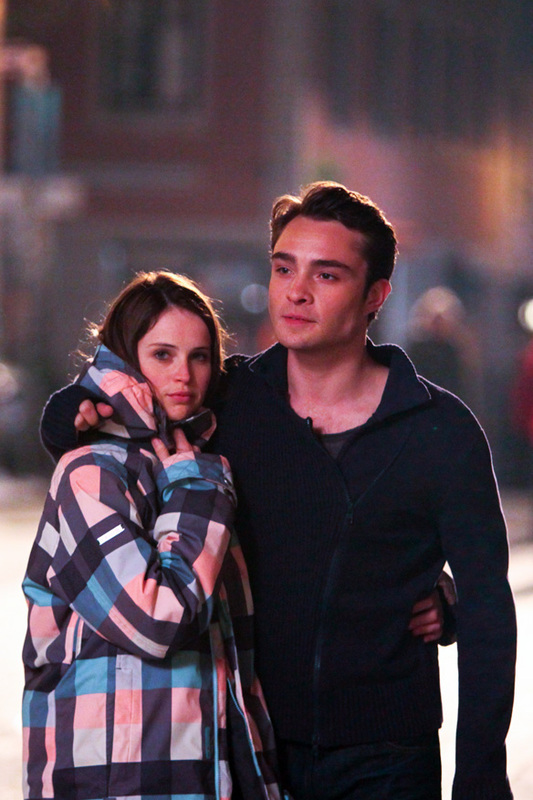 Felicity Jones as Kim and Ed Westwick as Jonny in Phil Traill's CHALET GIRL. An IFC Films release. Chalet Girl Films Ltd © 2011. 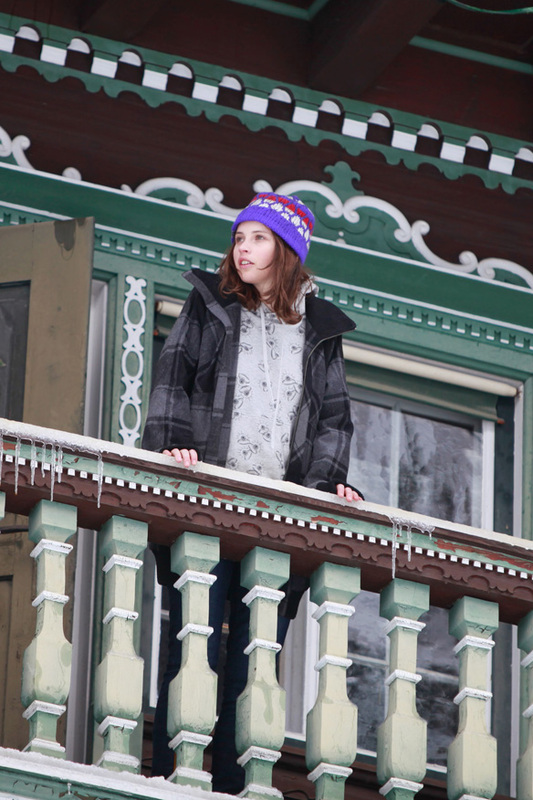 Felicity Jones as Kim in Phil Traill's CHALET GIRL. An IFC Films release. Chalet Girl Films Ltd © 2011.